Or was actually a giant stuffed panda. I’m sure that’s how the song actually goes. At least in our house. Let me explain. We decided that we were going to need a bigger table. I also realized that I will likely be buying everything in super large bulky size and will require two grocery carts to get through the store (mostly because the car carts at the grocery store only fit 2 kids…what am I suppose to do with the other 3? At least with two carts 4 of them can “drive” and the other can help push one of the carts…) I think I may see if before getting my paycheck the grocery store can just auto deduct 1/2 my check to their store. Another 1/3 will probably be going to the orthopedic doctors with our luck, and about 1/3 will go to Target, and 1/3 will go to buy socks because somehow we never have two that match (it’s worked great only needing one sock for Caedmon these past few weeks while he’s in a cast). And then I will likely have to pay work to work for them because I’m sure my fractions add up to more than what I get paid…. So anyway, back to what I was trying to say, we realized that we are going to need a bigger table. We bought a bench a few weeks ago and really liked the table that went with it and it was much bigger than our current one and expands to even bigger. And so thinking and talking through it the past couple of weeks we decided that we will go through with buying it. We don’t have the room right now for it, so we are going to store it at my parents until we buy a bigger house and move after the little ones are home. But we were afraid that now that we’ve decided on a table that we like, in 6-9 months when we are ready to buy it after buying a house, it wouldn’t be available any more. So that’s how we ended up at the furniture store the morning after Thanksgiving. Side note, toddlers and furniture stores are not the smartest idea….luckily there were a bunch of patio furniture displays near the table displays and I could distract them with trying out the chairs there for a few minutes. Also 4 year old boys are absolutely fascinated by urinals and need to broadcast to their moms all about the urinals they found and got to use in the restroom loudly across the store whenever they encounter one…such as the restroom at the furniture store. Of note, said 4 year old is not quite tall enough for urinal especially with one leg still in a cast, so I’m sure it was quite entertaining in that restroom with my husband trying to hold the 4 year up to use the urinal while keeping the 3 year old from getting into something…. Luckily we had talked and knew what we wanted and so our decision-making and debating had all been done at home while children were sleeping, it was just a matter of getting the table ordered and paying for it. The sales man said that the boys could follow him to the check out line and he would let them pick out a stuffed animal. Clint followed the sales man and I was trying to walk a little slower because a certain 4 year old was still enthusiastically telling me all about the urinal loudly and I wasn’t so sure all the people in the check out area would be quite as fascinated by such. The story finished and I managed to keep the 3 year olds hands in his pockets long enough to walk across the store and not break anything. That’s when we made it to the bin of animals. Caedmon asked if he could pick one out for Leighton because Leighton was at my parents for the weekend. The salesman said sure. And so Edric and Caedmon started pulling out animals and looking and deciding which one they wanted. 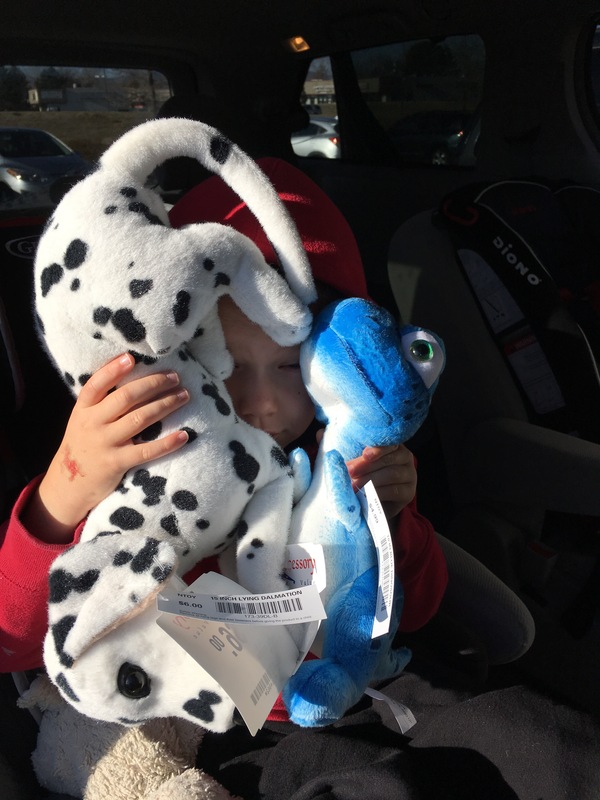 Caedmon found a “fire dog” for himself and then picked out a blue dinosaur for Leighton. 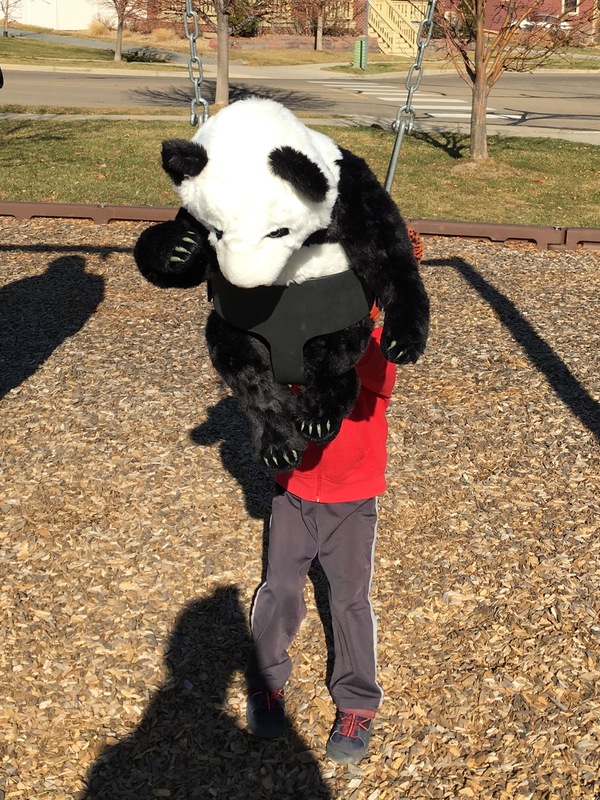 Edric however found a GIANT panda. I mean GIANT. Like almost as big as him. And there was no convincing him of choosing a different animal. 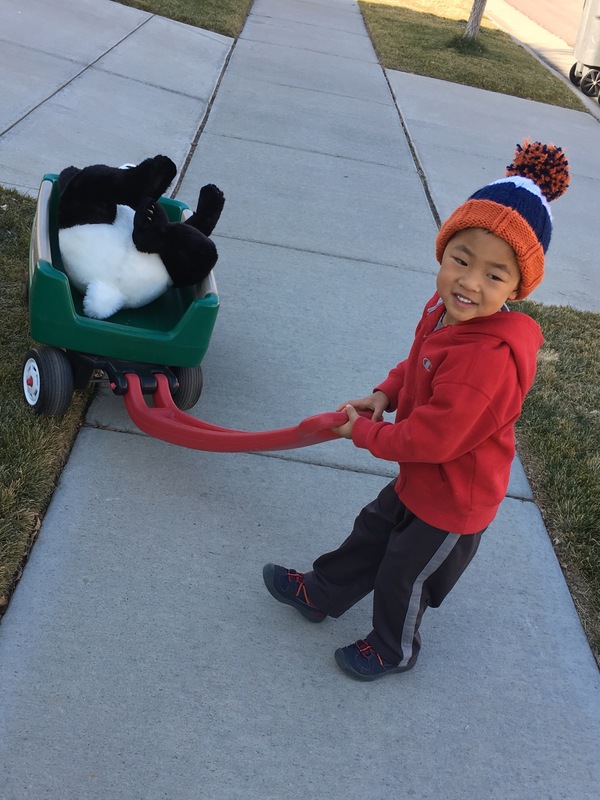 On the way home Caedmon named his fire dog, “Fred”, and Edric named the GIANT panda “Old McDonald”. Of course if anyone says “Old McDonald” Edric answers back by saying “E-I-E-I-O”. 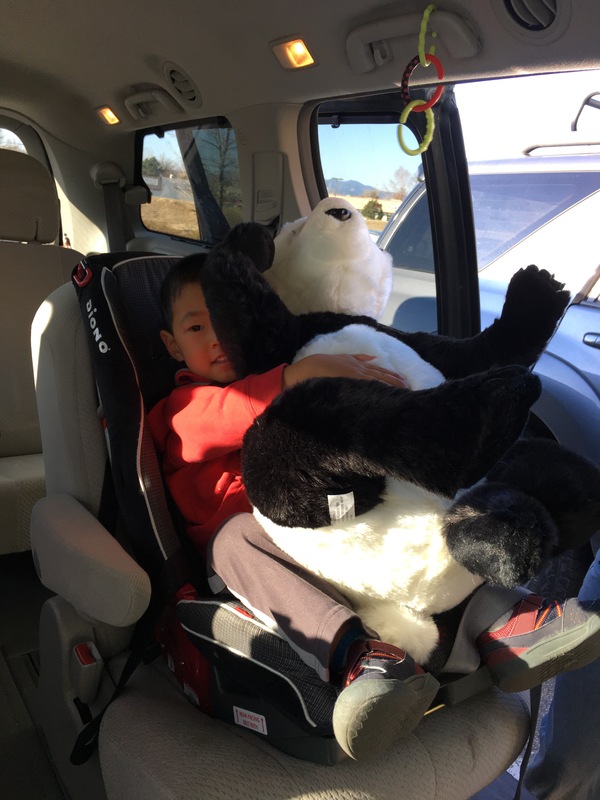 And so now we have a GIANT Old McDonald Panda living with us. He (it?) went to the park with us today and Edric was quite upset that they both couldn’t ride in the swing at the same time together. He was also upset tonight at bedtime when I told him that didn’t think I could not pick both him, Old McDonald, and his two blankets all up at the same time without dropping one or more of them. Somehow I managed to pick all of them up though and make it to the bed without dropping anyone or anything.